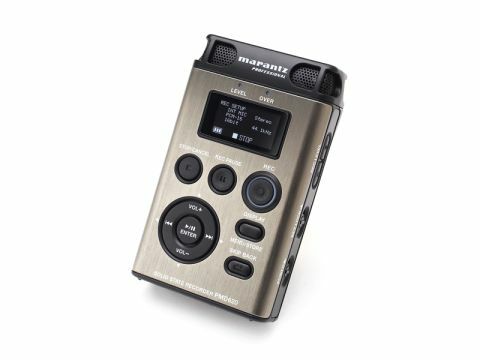 Alongside the familiar home electronics, Marantz does a nifty line of professional and semi-pro recording and replay kit, including several solid-state recorders, of which this is the smallest. It's a very smart unit and although the button layout may at first look a bit illogical, it has clearly been carefully thought, through, with a view to easy, regular use. The usual range of features is available, but we were a little taken aback by the way in which many of them are accessed and set up: it's necessary to use presets, which has some logic, but takes a bit of getting used to. The unit is supplied with a holder which has a screw thread for mounting to a tripod. Although noise is not quite as low as with some rivals, this proved to be a device capable of producing high-quality recordings, and subjectively its built-in microphones seem to us the most neutral. The mic and line in sockets both give excellent results in terms of distortion of all kinds and sound is correspondingly very clean and detailed. Marantz is to be congratulated on giving the PMD620 excellent overload headroom and 4.5V maximum input level, which is not bad from a 2.5V (two batteries) power supply. It drives headphones loudly and cleanly, maintaining distortion, analogue in to analogue out, below 0.01% even with low-impedance headphones attached. An fine device only let down, slightly, by odd ergonomics, slow USB up/download and noise performance a notch behind the current best.